While filmmaker Brett Morgen's long-in-the-works documentary about Kurt Cobain won't make its once-anticipated 2014 due date, the flick will debut next year through HBO. The film is now titled Kurt Cobain: Montage of Heck, and Morgen has brought onboard Cobain's 22-year-old daughter Frances Bean Cobain in as executive producer. This makes the film the first authorized documentary on the late Nirvana leader, who died in 1994. During the making of the project, Morgen is said to have had "access to Kurt Cobain's archives, home to his never-before-seen home movies, recordings, artwork, photography, journals, demos, personal archives, family archives and songbooks." 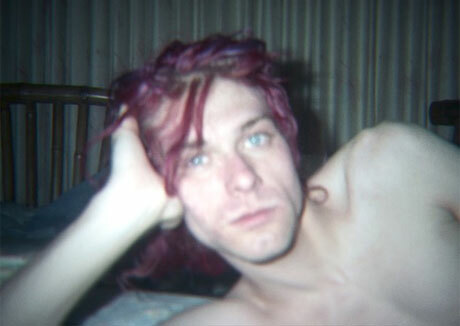 While Nirvana songs and performances will be used throughout Montage of Heck, the film is also said to include "previously unheard Cobain originals." You can see one of those newly uncovered photos of Cobain above. Details on the previously unreleased material have yet to be delivered, though Morgen and Frances Bean apparently sifted through 200 hours of audio. A firm air date has yet to be determined. Morgen had previously explained that the documentary will look at Cobain's life on- and offstage, showing the multiple sides to the beloved musician. I started work on this project eight years ago. Like most people, when I started, I figured there would be limited amounts of fresh material to unearth. However, once I stepped into Kurt's archive, I discovered over 200 hours of unreleased music and audio, a vast array of art projects (oil paintings, sculptures), countless hours of never-before-seen home movies, and over 4,000 pages of writings that together help paint an intimate portrait of an artist who rarely revealed himself to the media. If you think about Kurt, he's a contradiction. He could be sincere and sentimental, and also ironic and sarcastic. He was sweet and sour. He was incredibly funny too, and the film has to reflect his spirit.